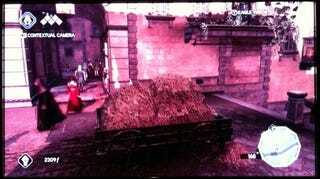 So, the Haystacks of Assassin's Creed II - Are They Any Bigger? Doesn't look like Ubisoft learned their physics lesson. Matt M., who helped the Kotaku Bureau of Weights & Measures calculate the cushion Altair would need in reality, thinks the haystacks are bigger in ACII. They still look puny to me. Remember, for one of the shortest jumps in the original (Dome of the Rock), we calculated Altair would need a pile three times as high and 41 times as large to stop the fall without Altair crashing through the cart and into the bricks below. So, "slightly larger," won't cut it, unless for some reason Ezio is "vastly lighter."